Well, we all know about these. If you don’t, head to Compass Box’s website and check out the long story of their battle for transparency in the whisky industry. I can only commend them. These have both just been released in the UK. You can also email them to learn the components and ages to these blended malts. Nose: Clynelish all over, hugely waxy and oily with candle wax, lovely fresh fruit, threads of smoke, slight black pepper. Taste: Soft, black pepper, candle wax continues, very waxy actually, some fresh fruit coming through, then more spice with some smoke. Finish: Medium/Long length. Waxy, spicy and tropical. Pushing the boundaries and our wallets (£200) but if I am honest I’d rather have a nice 20yo ib Clynelish at half the price (Review coming soon of exactly this). Nose: Fruit, spice, new oak with some floral elements, lavender. Taste: Soft arrival, floral again with white pepper, wax, Sherry and malty-ness. Finish: Long length. Lovely floral notes with Sherried malt. Lots of other malts I’d be buying at this price (£100). 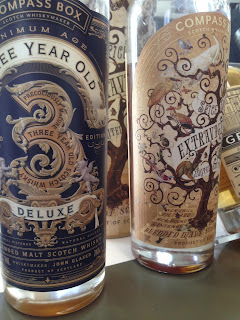 I really respect what Compass Box do and these whiskies are good but overpriced in my opinion. People will buy them anyway. Please keep in mind that generally (Compass Box joke in there) I really respect these guys but the only one of their whiskies I have really loved and bought is Flaming Heart 5th Ed. Maybe we just have different tastes?